Force Motors, formerly Bajaj Tempo, is best known for its utility vehicles which are majorly sold in the rural markets. The Force Trax is one such people mover sold in India and competes with the likes of the Tata Sumo and Mahindra Bolero. Although, not as successful as the Bolero, the Trax is still a popular choice thanks to the multiple seating options it offers ranging from 5 to 11. Latest spy shots have now revealed a seven door version undergoing testing! This comically long version of the Trax could, possibly, seat up to 18 people including the driver making it very unique prospect in the utility vehicle segment. Launch could take place this year with a slightly increased price of around a lakh over the current Trax Toofan available with a 11 seat configuration coming to around INR 9 lakhs on-road. Being a utility vehicle solely intended for commercial use, the Force Trax does without any comfort features. 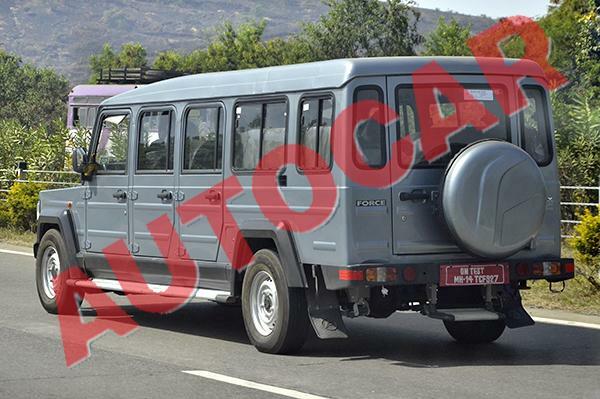 What you get is a very spartan, utilitarian interiors which has been maximised to fit as many passengers as possible. The Force Trax range is powered by 4 cylinder 2.6 litre diesel engine which produces 60bhp and 158Nm torque mated to a 5-speed gearbox. The seven door Force Trax will, most likely, get three front facing rows and the rest will be sideways facing jump seats. Undergoing homologation, the latest iteration of the Trax should be launched within the next three months. The current Force Trax range consists of four passenger variants- GAMA, Cruiser, Toofan and Ambulance and two multi utility carriers- Kargo-King and Delivery Van. The entire range of the Trax shares the exact same engine and mechanical underpinnings. Apart from this Force Motors also manufactures the Traveller mini bus and personal use vehicles Force Gurkha and Force One SUVs. Let’s see how the rural market responds to this limo like people carrier. Let us know what you think about the seven door Force Trax in the comments section below.